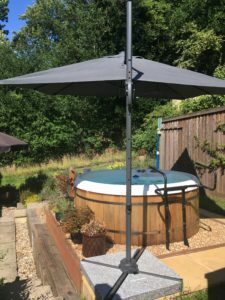 Both Tubs have huge 2.7m x 2.7m Cantilever Umbrellas for use over the hot tub for sunshine or rain if required. 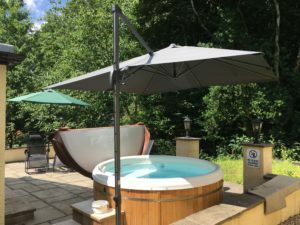 Pictured below the Acorns Hot Tub and the Retreat Hot Tub sporting their new super umbrellas! Ideal for rain or shine! Or fold it down and just enjoy! And remember, Hot Tubs are great in winter in cold and snowy weather! Set at 38c and ready for instant use – just purrrfect! Enjoying Hot Tubs in the snow! © 2018 Hedgehog Corner. All Rights Reserved.